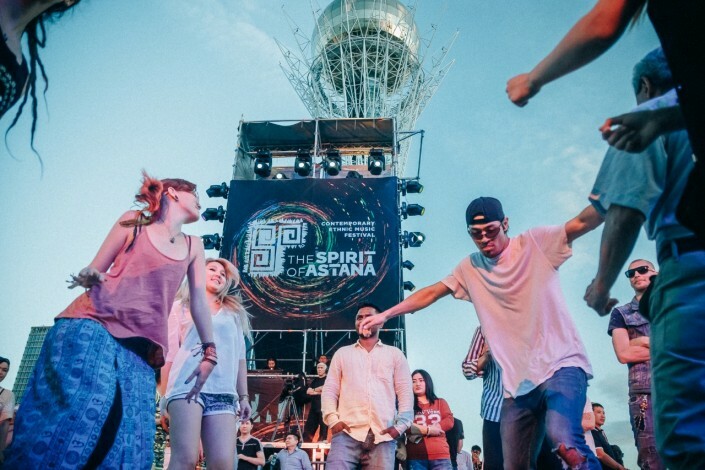 23.00 The three-day grand show in honor of the 20th anniversary of Astana - the International Festival of Contemporary Ethnic Music The Spirit of Astana 2018 has come to its end. Thank you for being with us! 22.55 "It is our first time in Kazakhstan, and we really like everything here. People here are very friendly. Nowadays, culture is very important, and it helps us to unite. Thank you for all the energy we have received from you!" - the musicians shared. 22.50 Mamadou Diabate & Percussion Mania did not let the audience relax for a minute. From the very beginning, the band took a high pace of the rhythm, which was maintained by the coordinated group work of the drummers. The continuous beat of national drums could not leave anyone indifferent. The musicians were also distinguished by active communication with the audience. Together with them, the audience learned the lines from the songs and surprisingly exactly repeated them in a single choir. "This is an amazing band that uses the sambla people instrument. The soloist who plays this instrument called the balaphone, has been playing music since the age of five, and the instrument itself is made from burned wood using a special technology. The most interesting thing is that only sambla can play it. It is believed that the sounds that are extracted from the instrument are similar to the language of the sambla people, so those who do not know the sambla language cannot play the balaphone," the general director of the media holding Alash Media Group Batyr Kazybaev said. 22.30 The Festival was visited by Akim of Astana Asset Issekeshev. The Akim came turned up at the peak of the event and said that he was pleased with his organization. "The Festival is excellent, we had the idea of it two years ago, and I think that with every year the scale will only increase, and it will be the best summer festival," Asset Issekeshev said. 22.20 The final chord of the Festival is the Mamadou Diabate & Percussion Mania band representing Burkina Faso and Senegal. 22.00 "First of all, I would like to congratulate all the guests and residents of the capital on the 20th anniversary of Astana. This Festival has been held here for the second year, just like last year it has been a great success this time. For the third day in a row, people just keep coming here and listen to each band. I myself am a professional musician and it is very close to my feelings. Ethnic music is one of the closest in spirit directions, so I find it very interesting. The Festival has become a true landmark event for our city. 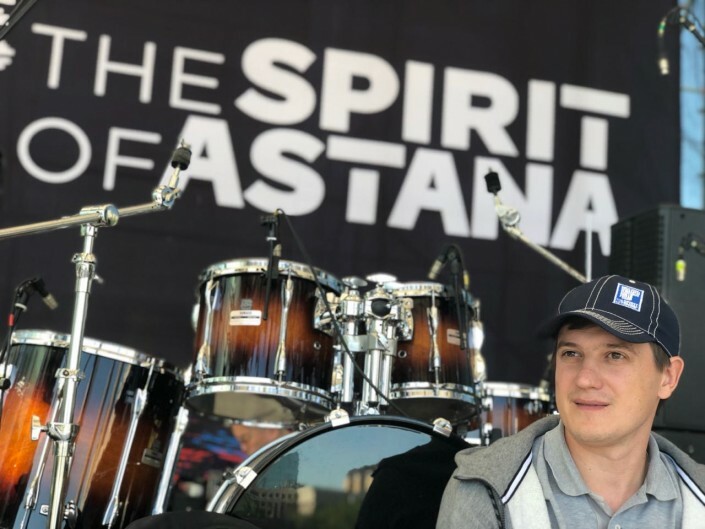 This music has found its place on this stage, and we must develop it," the head of the Department of Culture and Sports of Astana, Bolat Mazhagulov, said. 21.40 " To me as an organizer, the Festival begins long before the performances of the musicians. I know in advance who will come to perform, what they will show, so the Festival itself starts six months before. The most challenging moments in our work begin just before the start, but this is even better because if everything was simple, it would not be so interesting. People, coming here as audience, do not even know what tremendous work has been done. There are a lot of details here but we go through all this in order to please the fans " Festival's Head of Administration Konstantin Golovin shared. 21.25 The next on the stage is trio Dirtwire from the USA. 21.15 "Today I played music interspersed with electronics. I have two more performances ahead and I am guided by the mood of people, I think I will play something more fun and with a bigger drive. There are more people coming, so I will play dance music," DJ OMG said. 22.55 The drum solo was the real culmination of the musicians from Bashkortostan. Along with the sounds of the qurai the drummer of the band gradually increased the tempo, and the ending of the solo set the hall on fire. 20.45 "Playing here is an honor for us. This is our first visit to Kazakhstan, but this has been a very exciting trip and performance for us. I felt the spirit of the people who are here. We travel around the world, and I want to say that people here are amazing - I started to feel this from the airport. Our cultures are similar - we are nomads. The next time we come here, we will prepare much more interesting music for Kazakhstanis," the leader of the Peruvian group, Diogenesis Cuenco Alco, said. 20.30 Robert Yuldashev continues the grandiose show with his band “Quraisy” (Bashkortostan). 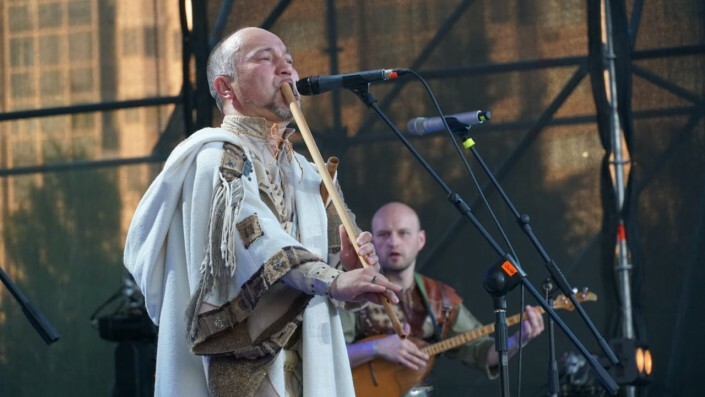 Robert Yuldashev is an ethno musician who plays on the oldest musical wind instrument - Qurai. Qurai is considered an original Bashkir instrument. It is made from cane growing in the South Urals. It was Robert Yuldashev who revealed the qurai to the world. There are a number of the most interesting music projects to his name. For example, cooperation with Nikolay Noskov, Garik Sukachev, Pelageya, as well as performances with theVladimir Spivakov's "Virtuosos of Moscow". 20.10 "Now we no longer experience great challenges in organizing the Festival. Everyone understands everything perfectly, everyone knows their area of ​​responsibility, and therefore for us to work at this Festival is a pure pleasure. 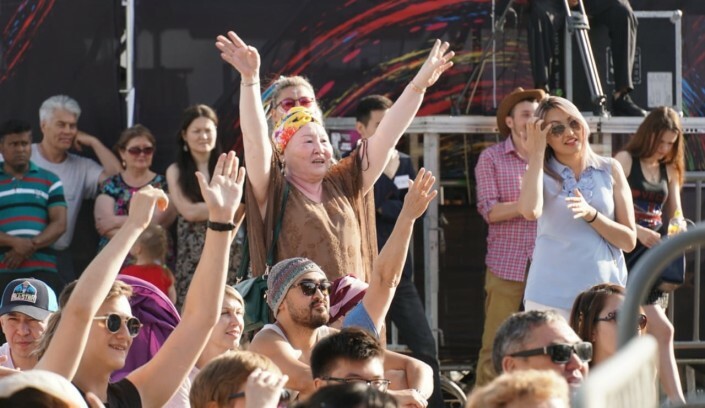 We would like to share our joy with the audience, so everyone could feel the depth, power and volume of this music ", the executive producer of the festival Madina Umorbekova said. 19.50 The vocalist of the group willingly gets along with the audience, noting the importance of the bonds between the cultures of nations. "This music comes from the soul, it comes from our hearts," he said. 19.30 Musicians surprised the audience not only with an unusual outfit, but also with a virtuoso playing the flute, which perfectly harmonized with the ethnic drums and electric guitar. This project involves native Americans, who in their compositions beat the ancient Native American motifs in modern arrangements. The first composition of the group turned out to be the soundtrack to film "The Last of the Mohicans". Indiogenes are the authors and performers of this familiar melody. 19.15 Meet for the first time in Kazakhstan, a group from Peru Indiogenes. 19.00 The amazing tri-vocal and energetic drum parts of the band from Lithuania started to really rock the atmosphere. First, the guests of the Festival began to dance and then dance in full. The highlight of the performance was the composition Uuu ta ta ta. Kazakhstanis warmly accepted this song, which became already recognizable trade mark of the collective. “This is a Lithuanian folk song about a bear, who was very high-minded, and said that he could climb a tree without branches. This is a song about pride,” the band member Laurita Peleniute shared. 18.40 The members of the band from Hungary, the Kerekes Band, who conquered everyone's heart with their music, today joined the audience of the Festival and enjoyed the performance of their colleagues from Lithuania. 18.25 The Festival is continued by the band from Lithuania Marga Muzika. Marga Muzika plays ethnic music of different nations in several languages transforming the songs in their own style The Lithuanian group play special folk and modern musical instruments to create exceptional and unconventional sounds. 18.00 "Ethnic music is extremely important because it fully shows the people's character. Literally, after one or two minutes of listening to the music, we can say what kind of people they are and what the can give to the world. We really like the Festival and its excellent sound, we really enjoyed playing here. It seems to me that our performance wend well, and this can be confirmed by people who enjoyed our performance," Yedil Khussainov said. 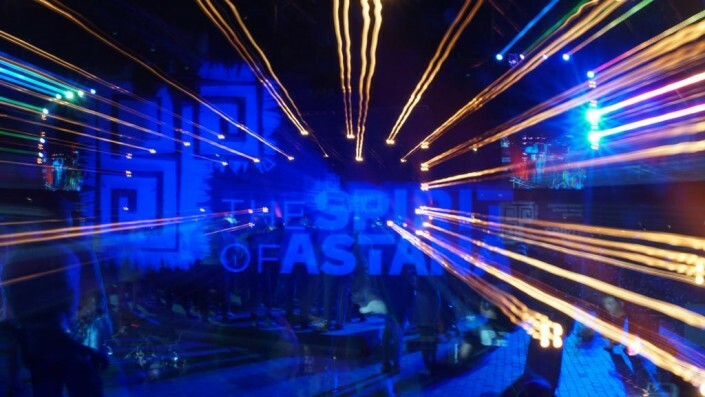 "The Spirit of Astana project is simply stunning. I would like such events to be held more often, because through these performances we can always show our talents. To the guys who perform after us, I want to wish good luck and that we could meet more often, may everyone be happy and healthy, " the famous musician added. 17.50 "It is difficult to find proper words what the musicians have in relation to our capital. There is a postcard view, beautiful architecture, a lot of space, air, and an acquaintance with the people of Kazakhstan. We believe that this is a good cultural experience that must go on. We should introduce the world with our nomadic culture, and we are only at the beginning of the road, " the general director of the media holding Alash Media Group, Batyr Kazybayev, shared. 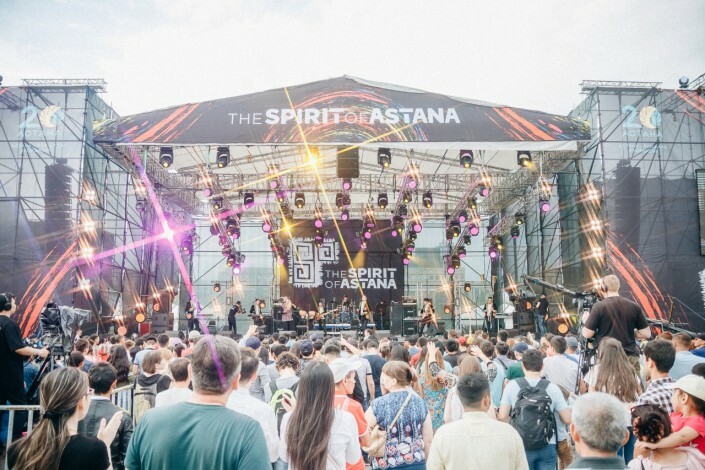 17.30 Day 3 of the International Festival of Contemporary Ethnic Music The Spirit of Astana 2018 has started! The final day of the grand show is opened by the Kazakhstani band Yedil & Satzhan Project. 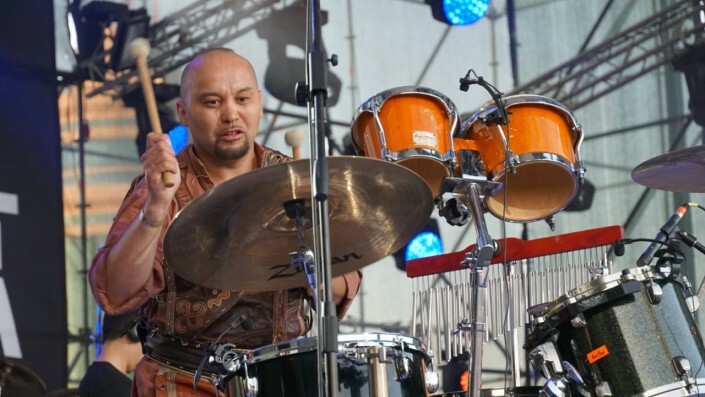 Famous Kazakh master of throat singing - musician Yedil Khussainov skillfuly mastering folk Kazakh instruments and jazz band Satzhan Project will present a unique synthesis of ancient and modern music. The main music event takes place in the square in front of the Baiterek monument. Free entrance. 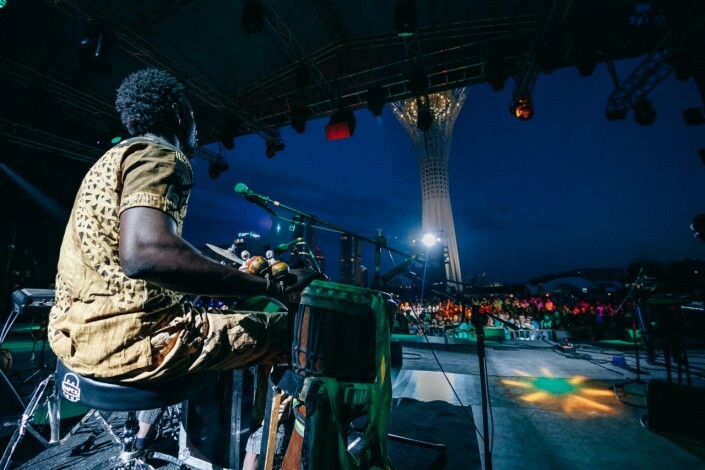 Contemporary Ethnic Music The Spirit of Astana 2018 is held with the support of the Astana Akimat as part of the celebration of the 20th anniversary of the capital of the Republic of Kazakhstan. The official water of the festival is ARZU. Recall that last year, the Project's partner was the supermarket chain Magnum Cash&Carry. For those who for some reason cannot personally come to the square in front of the Baiterek monument, this year there will be an online broadcast. The online broadcast will be available on Tengrinews.kz, as well as on the official channel of The Spirit of Tengri on YouTube. You will get a bright lighting show, only a live sound and a full immersion in the amazing atmosphere of a family holiday. 6, 7 and 8 July, the start of the online broadcast is at 17:00. Join the main event of this summer! Today, the most significant open-air venue of Kazakhstan welcomes Yedil & Satzhan Project (Kazakhstan), Indiogenes (Peru), Marga Muzika (Lithuania), Dirtwire (USA), Robert Yuldashev with the team of "Quraysy" (Bashkortostan), Yedil & Satzhan Project (Kazakhstan), Indiogenes (Peru) and Mamadou Diabate & Percussion Mania, representing Burkina Faso and Senegal. Astana residents and guests of the capital will enjoy the shows from 120 great bands from more than 23 countries. The musicians represent such far-abroad countries as Ireland, Burkina Faso, Senegal, Turkey, Japan, Mali, Hungary, Peru, the USA and India.